On the banks of Giudecca Island resides the Hilton Molino Stucky Venice, an iconic building that has defined the Venetian landscape for more than a century. The pinnacle of industrialist Giovanny Stucky’s commercial empire, the Molino Stucky originally functioned as one of Europe’s largest mills from the 1880s until the 1950s. For a time, the Molino Stucky produced some the highest quantities of flour on the entire continent. Labor strife, war, and Stucky’s untimely death all contributed to the gradual downfall of the mill, which ceased operating in 1955. The Italian company Societa Dell'Acqua Pia Antica Marcia SpA purchased the complex several decades later, eventually joining together with Hilton Hotels to transform the Molino Stucky into a hotel. 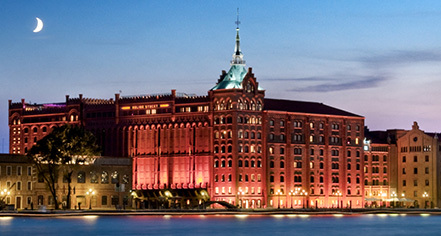 After completing a massive restoration of the site, Hilton opened the complex as the Hilton Molino Stucky Venice in 2007. With 379 guestrooms and suites, the Hilton Molino Stucky balances intimacy with scale. Guests have a variety of accommodations to choose from, including the efficient Executive rooms or the luxurious suites. The hotel also provides delicious Mediterranean cuisine at its distinguished eateries, including the Aromi and Bacaromi restaurants, as well as the serene Rialto Lobby Bar & Lounge. The Eforea Spa provides world-class physical treatments, rejuvenating the mind, body, and soul of every guest. And with 1,000 square meters of meeting space available, the Hilton Molino Stucky is a wonderful location for any business event, social gathering, or wedding. Only a five-minute boat ride from downtown Venice, the Hilton Molino Stucky is at a great juncture to start exploring the city. The entirety of Venice itself is a UNESCO World Heritage Site, containing some of the most historic architectural wonders in all of Europe. Guests can easily travel to the San Marco Basilica and the Doge’s Palace at the Piazza San Marco. The Ca’D’Oro and the Galleria Dell’Accademia display some of the most beautiful artwork ever created. Those interested in international shopping can venture to the Outlet Noventa di Piave, which offers designer brands at unrivaled prices. And Giudecca Island features its own fantastic destinations, including the Redentore Church, Tre Oci’s Art Gallery, and the Fortuny Factory. 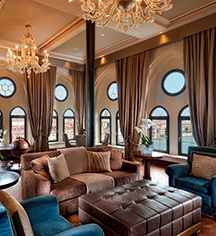 Guests can easily immerse themselves into Venice’s rich history just by staying at the Hilton Molino Stucky Venice. The Molino Stucky operated a pasta factory from its premises while it was a mill, which manufactured popular pastas for business on the other side of the Giudecca Canal. Age Requirements: Guests are required to be 18 years or older to reserve a room and check-in. ATM: An ATM is located on-site. Cancellation Policy: Varies according to booked rate. Deposit: At check-in, a €50 per day preauthorization is requested. Hotel/Resort Fees & Taxes: €5 for adults; €2.50 for kids between 10 and 16 years; free for kids under 10 years. Payment: Payment is required at time of booking. Visa, MasterCard, Amex, and Discover are accepted. Pet Policy: A fee of €75 per accommodation, per stay will be assessed. On the banks of Giudecca Island resides the Hilton Molino Stucky Venice, an iconic building that has defined the Venetian landscape for more than a century. The pinnacle of industrialist Giovanny Stucky’s commercial empire, the Molino Stucky originally functioned as one of Europe’s largest mills from the 1880s until the 1950s. Learn more about the History of Hilton Molino Stucky Venice .